Atorvastatin (INN) , marketed under the trade name Lipitor among others, is a member of the drug class known as statins, which are used primarily for lowering blood cholesterol and for prevention of events associated with cardiovascular disease. Like all statins, atorvastatin works by inhibiting HMG-CoA reductase, an enzyme found in liver tissue that plays a key role in production of cholesterol in the body. Atorvastatin was discovered by Bruce Roth and coworkers at Parke-Davis, since acquired by Warner-Lambert and then Pfizer. Although atorvastatin was the fifth drug in the class of statins to be developed, clinical trials showed that atorvastatin caused a more dramatic reduction in LDL-C than the other statin drugs. From 1996 to 2012 under the trade name Lipitor, atorvastatin became the world's best-selling drug of all time, with more than US$125 billion in sales over approximately 14.5 years. Pfizer's patent on atorvastatin expired in November 2011. Hypercholesterolemia (heterozygous familial and nonfamilial) and mixed dyslipidemia (Fredrickson types IIa and IIb) to reduce total cholesterol, LDL-C, apo-B, triglycerides levels, and CRP as well as increase HDL levels. Primary prevention of heart attack, stroke, and need for revascularization procedures in patients who have risk factors such as age, smoking, high blood pressure, low HDL-C, and a family history of early heart disease, but have not yet developed clinically evident coronary heart disease. Secondary prevention of myocardial infarction, stroke, unstable angina, and revascularization in people with established coronary heart disease. There have been recent studies suggesting that high-dose statin therapy plays a plaque-stabilizing role in patients suffering from acute coronary syndrome and thrombotic stroke. Atorvastatin may be used in combination with bile acid sequestrants and ezetimibe to increase the reduction in cholesterol levels. However, It is not recommended to combine statin drug treatment with certain other cholesterol-lowering drugs, particularly fibrates, because this may increase the risk of myopathy-related adverse effects. Geriatric: Plasma concentrations of atorvastatin in healthy elderly subjects are higher than those in young adults, and clinical data suggests a greater degree of LDL-lowering at any dose for patients in the population as compared to young adults. Pediatric: Pharmacokinetic data is not available for this population. Gender: Plasma concentrations are generally higher in women than in men, but there is no clinically significant difference in the extent of LDL reduction between men and women. Renal impairment: Renal disease has no influence on plasma concentrations of atorvastatin and dosing need not be adjusted in these patients. Hemodialysis: Hemodialysis will not significantly alter drug levels or change clinical effect of atorvastatin. Hepatic impairment: In patients with chronic alcoholic liver disease, levels of atorvastatin may be significantly increased depending upon the extent of liver disease. Pregnancy: Atorvastatin may cause fetal harm by affecting serum cholesterol and triglyceride levels, which are essential for fetal development. Breastfeeding: Small amounts of other statin drugs have been found to pass into breast milk, although atorvastatin has not been studied, specifically. Markedly elevated CPK levels or if a myopathy is suspected or diagnosed after dosing of atorvastatin has begun. Very rarely, atorvastatin may cause rhabdomyolysis, and it may be very serious leading to acute renal failure due to myoglobinuria. If rhabdomyolysis is suspected or diagnosed, atorvastatin therapy should be discontinued immediately. The likelihood of developing a myopathy is increased by the co-administration of cyclosporine, fibric acid derivatives, erythromycin, niacin, and azole antifungals. Myopathy with elevation of creatinine kinase (CK) and rhabdomyolysis are the most serious side effects, occurring rarely at a rate of 2.3 to 9.1 per 10,000 person-years among patients taking atorvastatin. As mentioned previously, atorvastatin should be discontinued immediately if this occurs. Persistent liver enzyme abnormalities occurred in 0.7% of patients who received atorvastatin in clinical trials. It is recommended that hepatic function be assessed with laboratory tests before beginning atorvastatin treatment and repeated as clinically indicated thereafter. If evidence of serious liver injury occurs while a patient is taking atorvastatin, it should be discontinued and not restarted until the etiology of the patient's liver dysfunction is defined. If no other cause is found, atorvastatin should be discontinued permanently. Diabetes mellitus type 2, an uncommon class effect of all statins. The following have been shown to occur in 1–10% of patients taking atorvastatin in clinical trials. High-dose atorvastatin have also been associated with worsening glycemic control. The FDA has received reports of memory loss in statin users. Generally, these were mild and reversible on cessation of drug treatment. Co-administration of atorvastatin with one of CYP3A4 inhibitors such as itraconazole, telithromycin, and voriconazole, may increase serum concentrations of atorvastatin, which may lead to adverse reactions. This is less likely to happen with other CYP3A4 inhibitors such as diltiazem, erythromycin, fluconazole, ketoconazole, clarithromycin, cyclosporine, protease inhibitors, or verapamil, and only rarely with other CYP3A4 inhibitors, such as amiodarone and aprepitant. Often, bosentan, fosphenytoin, and phenytoin, which are CYP3A4 inducers, can decrease the plasma concentrations of atorvastatin. Only rarely, though, barbiturates, carbamazepine, efavirenz, nevirapine, oxcarbazepine, rifampin, and rifamycin, which are also CYP3A4 inducers, can decrease the plasma concentrations of atorvastatin. Oral contraceptives increased AUC values for norethindrone and ethinyl estradiol; these increases should be considered when selecting an oral contraceptive for a woman taking atorvastatin. Antacids can rarely decrease the plasma concentrations of statin drugs, but do not affect the LDL-C-lowering efficacy. Statins may also alter the concentrations of other drugs, such as warfarin or digoxin, leading to alterations in effect or a requirement for clinical monitoring. Co-administration of grapefruit juice with atorvastatin may cause an increase in Cmax and AUC, which can lead to adverse reactions or overdose toxicity. As with other statins, atorvastatin is a competitive inhibitor of HMG-CoA reductase. Unlike most others, however, it is a completely synthetic compound. HMG-CoA reductase catalyzes the reduction of 3-hydroxy-3-methylglutaryl-coenzyme A (HMG-CoA) to mevalonate, which is the rate-limiting step in hepatic cholesterol biosynthesis. Inhibition of the enzyme decreases de novo cholesterol synthesis, increasing expression of low-density lipoprotein receptors (LDL receptors) on hepatocytes. This increases LDL uptake by the hepatocytes, decreasing the amount of LDL-cholesterol in the blood. Like other statins, atorvastatin also reduces blood levels of triglycerides and slightly increases levels of HDL-cholesterol. Recent studies have shown that in patients suffering from acute coronary syndrome, high-dose statin treatment may play a plaque-stabilizing role. At high doses, statins have anti-inflammatory effects, incite reduction of the necrotic plaque core, and improve endothelial function, leading to plaque stabilization and, sometimes, plaque regression. However, there is an increased risk of statin-associated adverse effects with such high-dose statin treatment. There is a similar thought process and risks associated with using high-dose statins to prevent recurrence of thrombotic stroke. The liver is the primary site of action of atorvastatin, as this is the principal site of both cholesterol synthesis and LDL clearance. It is the dosage of atorvastatin, rather than systemic drug concentration, which correlates with extent of LDL-C reduction. Atorvastatin undergoes rapid absorption when taken orally, with an approximate time to maximum plasma concentration (Tmax) of 1–2 h. The absolute bioavailability of the drug is about 14%, but the systemic availability for HMG-CoA reductase activity is approximately 30%. Atorvastatin undergoes high intestinal clearance and first-pass metabolism, which is the main cause for the low systemic availability. Administration of atorvastatin with food produces a 25% reduction in Cmax (rate of absorption) and a 9% reduction in AUC (extent of absorption), although food does not affect the plasma LDL-C-lowering efficacy of atorvastatin. Evening dose administration is known to reduce the Cmax and AUC by 30% each. However, time of administration does not affect the plasma LDL-C-lowering efficacy of atorvastatin. Atorvastatin is primarily eliminated via hepatic biliary excretion, with less than 2% recovered in the urine. Bile elimination follows hepatic and/or extrahepatic metabolism. There does not appear to be any entero-hepatic recirculation. Atorvastatin has an approximate elimination half-life of 14 h. Noteworthy, the HMG-CoA reductase inhibitory activity appears to have a half-life of 20–30 h, which is thought to be due to the active metabolites. Atorvastatin is also a substrate of the intestinal P-glycoprotein efflux transporter, which pumps the drug back into the intestinal lumen during drug absorption. In hepatic insufficiency, plasma drug concentrations are significantly affected by concurrent liver disease. Patients with A-stage liver disease show a four-fold increase in both Cmax and AUC. Patients with B-stage liver disease show a 16-fold increase in Cmax and an 11-fold increase in AUC. Geriatric patients (>65 years old) exhibit altered pharmacokinetics of atorvastatin compared to young adults, with mean AUC and Cmax values that are 40% and 30% higher, respectively. Additionally, healthy elderly patients show a greater pharmacodynamic response to atorvastatin at any dose; therefore, this population may have lower effective doses. Atorvastatin synthesis in commercial production (process) chemistry. The key step of establishing this drug's stereocenters, through initial use of an inexpensive natural product (chiral pool approach). The first synthesis of atorvastatin at Parke-Davis that occurred during drug discovery was racemic followed by chiral chromatographic separation of the enantiomers. An early enantioselective route to atorvastatin made use of an ester chiral auxiliary to set the stereochemistry of the first of the two alcohol functional groups via a diastereoselective aldol reaction. Once the compound entered pre-clinical development, process chemistry developed a cost-effective and scalable synthesis. In atorvastatin's case, a key element of the overall synthesis was ensuring stereochemical purity in the final drug substance, and hence establishing the first stereocenter became a key aspect of the overall design. The final commercial production of atorvastatin relied on a chiral pool approach, where the stereochemistry of the first alcohol functional group was carried into the synthesis—through the choice of isoascorbic acid, an inexpensive and easily sourced plant-derived natural product. Atorvastatin calcium tablets are marketed by Pfizer under the trade name Lipitor for oral administration. Tablets are white, elliptical, and film-coated. Pfizer also packages the drug in combination with other drugs, such as with Caduet. Pfizer recommends that patients do not break tablets in half to take half-doses, even when this is recommended by their doctors. Pfizer's U.S. patent on Lipitor expired on 30 November 2011. Initially, generic atorvastatin was manufactured only by Watson Pharmaceuticals and India's Ranbaxy Laboratories. Prices for the generic version did not drop to the level of other generics—$10 or less for a month's supply—until other manufacturers began to supply the drug in May 2012. In other countries, atorvastatin calcium is made in tablet form by generic drug makers under various brand names including Stator, Atorvastatin Teva, Litorva, Torid, Atoris, Atorlip, Mactor, Lipvas, Sortis, Torvast, Torvacard, Totalip, and Tulip. Pfizer also makes its own generic version under the name Zarator, which is the sole Pharmac-subsidised brand of atorvastatin in New Zealand. On 9 November 2012, Indian drugmaker Ranbaxy Laboratories Ltd. voluntarily recalled 10-, 20- and 40-mg doses of its generic version of atorvastatin in the United States. The lots of atorvastatin, packaged in bottles of 90 and 500 tablets, were recalled due to possible contamination with very small glass particles similar to the size of a grain of sand (less than 1 mm in size). The FDA received no reports of injury from the contamination. ^ "Pfizer product promotion page (Lipitor)". Retrieved 2011-12-05. ^ a b c d Roth BD (2002). "The discovery and development of atorvastatin, a potent novel hypolipidemic agent". Prog Med Chem. Progress in Medicinal Chemistry 40: 1–22. ^ Milton L. Hoefle (2000). "The Early History of Parke-Davis and Company" (PDF). Bull. Hist. Chem. 25 (1): 28–34. ^ "Pfizer Gets Its Deal to Buy Warner-Lambert for $90.2 Billion". New York Times. 2000. ^ John Simons (20 January 2003). "The $10 Billion Pill Hold the fries, please. Lipitor, the cholesterol-lowering drug, has become the bestselling pharmaceutical in history. Here's how Pfizer did it". Fortune Magazine. ^ "Lipitor becomes world's top-selling drug". Crain's New York Business. 2011-12-28. ^ a b CNN Wire Staff (30 November 2011). "Lipitor loses patent, goes generic". ^ "Atorvastatin Calcium". Drugs.com. Retrieved 3 April 2011. ^ a b c McCrindle BW, Ose L, Marais AD (July 2003). "Efficacy and safety of atorvastatin in children and adolescents with familial hypercholesterolemia or severe hyperlipidemia: a multicenter, randomized, placebo-controlled trial". J. Pediatr. 143 (1): 74–80. ^ Nissen SE, Nicholls SJ, Sipahi I, Libby P, Raichlen JS, Ballantyne CM, Davignon J, Erbel R, Fruchart JC, Tardif JC, Schoenhagen P, Crowe T, Cain V, Wolski K, Goormastic M, Tuzcu EM (April 2006). "Effect of very high-intensity statin therapy on regression of coronary atherosclerosis: the ASTEROID trial". ^ Nawrocki JW, Weiss SR, Davidson MH, Sprecher DL, Schwartz SL, Lupien PJ, Jones PH, Haber HE, Black DM (May 1995). "Reduction of LDL cholesterol by 25% to 60% in patients with primary hypercholesterolemia by atorvastatin, a new HMG-CoA reductase inhibitor". Arterioscler. Thromb. Vasc. Biol. 15 (5): 678–82. ^ Bakker-Arkema RG, Davidson MH, Goldstein RJ, Davignon J, Isaacsohn JL, Weiss SR, Keilson LM, Brown WV, Miller VT, Shurzinske LJ, Black DM (January 1996). "Efficacy and safety of a new HMG-CoA reductase inhibitor, atorvastatin, in patients with hypertriglyceridemia". ^ Ozaki K, Kubo T, Imaki R, Shinagawa H, Fukaya H, Ohtaki K, Ozaki S, Izumi T, Aizawa Y (August 2006). "The anti-atherosclerotic effects of lipid lowering with atorvastatin in patients with hypercholesterolemia". J. Atheroscler. Thromb. 13 (4): 216–9. ^ Marais AD, Firth JC, Bateman ME, Byrnes P, Martens C, Mountney J (August 1997). "Atorvastatin: an effective lipid-modifying agent in familial hypercholesterolemia". Arterioscler. Thromb. Vasc. Biol. 17 (8): 1527–31. ^ a b Rossi S, ed. (2006). Australian medicines handbook 2006. Adelaide, S. Aust: Australian Medicines Handbook Pty Ltd.
^ a b c d e f g h i j k l m "LIPITOR (atorvastatin calcium) Tablets for oral administration" (PDF). Full Prescribing Information. Pfizer Inc. Retrieved 18 April 2014. ^ Sever PS, Dahlöf B, Poulter NR, Wedel H, Beevers G, Caulfield M, Collins R, Kjeldsen SE, Kristinsson A, McInnes GT, Mehlsen J, Nieminen M, O'Brien E, Ostergren J (April 2003). "Prevention of coronary and stroke events with atorvastatin in hypertensive patients who have average or lower-than-average cholesterol concentrations, in the Anglo-Scandinavian Cardiac Outcomes Trial--Lipid Lowering Arm (ASCOT-LLA): a multicentre randomised controlled trial". Lancet 361 (9364): 1149–58. ^ Law MR, Wald NJ, Rudnicka AR (June 2003). "Quantifying effect of statins on low density lipoprotein cholesterol, ischaemic heart disease, and stroke: systematic review and meta-analysis". BMJ 326 (7404): 1423. ^ Wilson PW, D'Agostino RB, Levy D, Belanger AM, Silbershatz H, Kannel WB (May 1998). "Prediction of coronary heart disease using risk factor categories" (PDF). ^ Jones P, Kafonek S, Laurora I, Hunninghake D (March 1998). "Comparative dose efficacy study of atorvastatin versus simvastatin, pravastatin, lovastatin, and fluvastatin in patients with hypercholesterolemia (the CURVES study)". ^ Colhoun HM, Betteridge DJ, Durrington PN, Hitman GA, Neil HA, Livingstone SJ, Thomason MJ, Mackness MI, Charlton-Menys V, Fuller JH (2004). "Primary prevention of cardiovascular disease with atorvastatin in type 2 diabetes in the Collaborative Atorvastatin Diabetes Study (CARDS): multicentre randomised placebo-controlled trial". Lancet 364 (9435): 685–96. ^ Neil HA, DeMicco DA, Luo D, Betteridge DJ, Colhoun HM, Durrington PN, Livingstone SJ, Fuller JH, Hitman GA (November 2006). "Analysis of efficacy and safety in patients aged 65-75 years at randomization: Collaborative Atorvastatin Diabetes Study (CARDS)". Diabetes Care 29 (11): 2378–84. ^ Gentile S, Turco S, Guarino G, Sasso CF, Amodio M, Magliano P, Salvatore T, Corigliano G, Agrusta M, De Simone G, Gaeta I, Oliviero B, Torella R (December 2000). "Comparative efficacy study of atorvastatin vs simvastatin, pravastatin, lovastatin and placebo in type 2 diabetic patients with hypercholesterolaemia". Diabetes Obes Metab 2 (6): 355–62. ^ a b Rosa GM, Carbone F, Parodi A, Massimelli EA, Brunelli C, Mach F, Vuilleumier N, Montecucco F (2014). "Update on the efficacy of statin treatment in acute coronary syndromes". Eur. J. Clin. Invest. 44 (5): 501–15. ^ a b Furie KL (2012). "High-dose statins should only be used in atherosclerotic strokes". Stroke 43 (7): 1994–5. ^ "Executive Summary of The Third Report of The National Cholesterol Education Program (NCEP) Expert Panel on Detection, Evaluation, And Treatment of High Blood Cholesterol In Adults (Adult Treatment Panel III)". JAMA 285 (19): 2486–97. 2001. ^ Grundy SM, Cleeman JI, Merz CN, Brewer HB, Clark LT, Hunninghake DB, Pasternak RC, Smith SC, Stone NJ (2004). "Implications of recent clinical trials for the National Cholesterol Education Program Adult Treatment Panel III guidelines". Circulation 110 (2): 227–39. ^ Hermann M, Bogsrud MP, Molden E, Asberg A, Mohebi BU, Ose L, Retterstøl K (June 2006). "Exposure of atorvastatin is unchanged but lactone and acid metabolites are increased several-fold in patients with atorvastatin-induced myopathy". Clin. Pharmacol. Ther. 79 (6): 532–9. ^ a b c d e Williams D, Feely J (2002). "Pharmacokinetic-pharmacodynamic drug interactions with HMG-CoA reductase inhibitors". Clin Pharmacokinet 41 (5): 343–70. ^ a b c d e Lipitor: Prescribing Information. Pfizer. June 2009. ^ a b Ghirlanda G, Oradei A, Manto A, Lippa S, Uccioli L, Caputo S, Greco AV, Littarru GP (March 1993). "Evidence of plasma CoQ10-lowering effect by HMG-CoA reductase inhibitors: a double-blind, placebo-controlled study". J Clin Pharmacol 33 (3): 226–9. ^ Macedo AF, Taylor FC, Casas JP, Adler A, Prieto-Merino D, Ebrahim S (2014). "Unintended effects of statins from observational studies in the general population: systematic review and meta-analysis". BMC Med 12: 51. ^ Mayo Clinic Staff. "Statin Side Effects: Weigh the Risks and Benefits". The Mayo Clinic. Retrieved 19 April 2014. ^ Kostapanos MS, Liamis GL, Milionis HJ, Elisaf MS (September 2010). "Do statins beneficially or adversely affect glucose homeostasis?". Curr Vasc Pharmacol 8 (5): 612–31. ^ Steiner G (December 2007). "Atherosclerosis in type 2 diabetes: a role for fibrate therapy?". Diab Vasc Dis Res 4 (4): 368–74. ^ Graham DJ, Staffa JA, Shatin D, Andrade SE, Schech SD, La Grenade L, Gurwitz JH, Chan KA, Goodman MJ, Platt R (December 2004). "Incidence of hospitalized rhabdomyolysis in patients treated with lipid-lowering drugs". ^ Mazzu AL, Lasseter KC, Shamblen EC, Agarwal V, Lettieri J, Sundaresen P (October 2000). "Itraconazole alters the pharmacokinetics of atorvastatin to a greater extent than either cerivastatin or pravastatin". Clin. Pharmacol. Ther. 68 (4): 391–400. ^ Neuvonen PJ, Niemi M, Backman JT (December 2006). "Drug interactions with lipid-lowering drugs: mechanisms and clinical relevance". Clin. Pharmacol. Ther. 80 (6): 565–81. ^ Backman JT, Luurila H, Neuvonen M, Neuvonen PJ (August 2005). "Rifampin markedly decreases and gemfibrozil increases the plasma concentrations of atorvastatin and its metabolites". Clin. Pharmacol. Ther. 78 (2): 154–67. ^ "Lipitor". U.S. National Library of Medicine. ^ McKenney JM (2005). "Efficacy and safety of rosuvastatin in treatment of dyslipidemia". Am J Health Syst Pharm 62 (10): 1033–47. ^ Schwartz JB (February 2009). "Effects of vitamin D supplementation in atorvastatin-treated patients: a new drug interaction with an unexpected consequence". Clin. Pharmacol. Ther. 85 (2): 198–203. ^ Kane GC, Lipsky JJ (September 2000). "Drug-grapefruit juice interactions". ^ Deshmukh HA, Colhoun HM, Johnson T, McKeigue PM, Betteridge DJ, Durrington PN, Fuller JH, Livingstone S, Charlton-Menys V, Neil A, Poulter N, Sever P, Shields DC, Stanton AV, Chatterjee A, Hyde C, Calle RA, Demicco DA, Trompet S, Postmus I, Ford I, Jukema JW, Caulfield M, Hitman GA (May 2012). "Genome-wide association study of genetic determinants of LDL-c response to atorvastatin therapy: importance of Lp(a)". J Lipid Res 53 (5): 1000–1011. ^ Roth BD, Blankley CJ, Chucholowski AW, Ferguson E, Hoefle ML, Ortwine DF, Newton RS, Sekerke CS, Sliskovic DR, Wilson M (1991). "Inhibitors of Cholesterol Biosynthesis. 3. Tetrahydro-4-hydroxy-6-[2-(1H-pyrrol-1-yl)ethyl]-2H-pyran 2-one Inhibitors of HMG-CoA Reductase. 2. Effects of Introducing Substituents at Positions Three and Four of the Pyrrole Nucleus". .
^ Jie Jack Li, Douglas S. Johnson, Drago R. Sliskovic, Bruce D. Roth (2004). "Chapter 9. 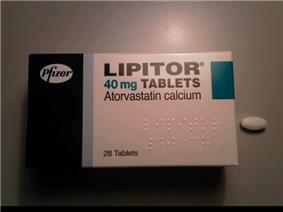 Atorvastatin Calcium (Lipitor)". Contemporary Drug Synthesis. John Wiley & Sons, Inc. pp. 113–125. .
^ Medical Product Reviews. "Atorvastatin Calcium (Lipitor Tablets) - Uses, Dosage and Side Effects". Retrieved 3 May 2012. ^ News Medical. "Lipitor - What is Lipitor?". Retrieved 3 May 2012. ^ "Price to UK for 28 tablets from £3.25 (10mg) to £10.00 (80mg)". ^ "Pfizer 2008 Annual Report" (PDF). Pfizer. 23 April 2009. Retrieved 7 August 2009. ^ Rapley, Lisa (31 May 2012). "Atorvastatin sole funding announced". PharmacyToday.co.nz. Retrieved 16 July 2014. ^ "FDA Statement on Ranbaxy Atorvastatin Recall". FDA. Retrieved 19 April 2014. "Highlights of prescribing information" (pdf). Lipitor (atorvastatin calcium) Tablets for oral administration. Pfizer. 2009-06-01. Retrieved 2011-10-26. Maggon K (June 2005). "Best-selling human medicines 2002-2004". Drug Discov. Today 10 (11): 739–42. Simons J (2003-01-20). "The $10 Billion Pill Hold the fries, please. Lipitor, the cholesterol-lowering drug, has become the bestselling pharmaceutical in history. Here's how Pfizer did it". Fortune. Retrieved 2011-10-26. Winslow R (2000-01-24). "The Birth of a Blockbuster: Lipitor's Route out of the Lab". "Ann Arbor chemist wins national award for drug discovery". ScienceBlog. American Chemical Society. 2003-03-01. Retrieved 2011-10-26. Rowe A (2008-08-20). "Meet the Guy Who Invented Lipitor". Wired Science. Wired.com. Retrieved 2011-10-26. Bernstein M (2008-08-16). "Chemical Society To Honor 'Heroes Of Chemistry' During National Meeting". Medical News Today. Retrieved 2011-10-26. He L (2003-09-27). "Bruce D. Roth, Pfizer Inc, USA". Chinese Academy of Sciences·Institute of Process Engineering. Retrieved 2011-10-26.